01/07/14 – Details from Chris Teslak regarding FACS and other titles they worked on. 25/05/14 – Added Chris Teslak as coder. This was to be an Ikari Warriors style game converted from the SNK arcade to the C64 by F.A.C.S (Financial Accounting and Computing Software) – a West Bloomfield Township, Michigan company. Previously and very strangely, Sales Curve were linked to the game back in 1988 with a separate development which seemed to fall through after FIL (The French company with Sales Curve as its UK division) lost funding. However in 1989, another team picked up the licence it seems. According to a wiki page – the engine and much of the game-play was in place – but the development company folded before the project could be finished off. The game however did eventually get published on NES, PC, Apple II in 1989 by Data East. 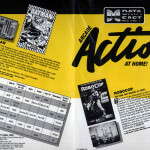 So has anything survived of this game?… Where did the information on F.A.C.S come from originally?….. Was it from an employee of the company who could help us find the game?… A Data East sales leaflet from 1989 stated that the game was due for release in Summer’89… which of course never happened. Well, in May 2014 – Chris Teslak got in touch with GTW64 and confirmed that he was one of the developers who worked on the conversion. He left the company before the company went under. He was working on the game with another developer and his supervisor (names unconfirmed as of yet). 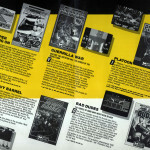 This was to be the only game which FACS ever had any involvement in on the C64 at least – they could have been involved in more, but it was not to be due to FACS closing down before their Heavy Barrel conversion could see a release. 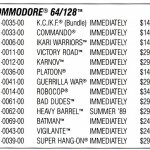 FACS did do work on conversions of The Games – Winter Edition and Spiderbot to the PC – more details under creator speaks. The plan was to release the Heavy Barrel conversion to Data East in 6 deliverables in total, and according to Chris he believes that they got up to the 4th deliverable at the time of cancellation. Most of the game was translated to the C64 by playing the arcade game and making notes and capturing requirements. Most of the specifics of the development you can read from Chris himself under Creator Speaks, which is a fascinating read!. The game was shaping up very nicely, but the company couldn’t quite hold on to see the game out. It is still early days, but Chris has offered hope that he may still have something of the game to save and preserve. It is very hopeful, but we could see the beginnings of the conversion at a fairly advanced state. Watch this space for now! “We were shipped a console from Data East and no specs, art, or any other supporting documentation so my partner and I had to spend 2 weeks playing the game to capture requirements from which to code it on the C-64. We had keys do we could access the DIP switches that control number of lives, etc. We noted that the original game was running on a 25MHz 68020. The C-64, as you know is a 1.02 MHz 6510A. We also noted that at one point during play there were 75 sprite images on the screen at one time, independently moving. Plus, the screen was a 3:4 aspect ratio but turned vertical. Programming a C-64 to replicate the look and feel of the game was going to be very challenging. The C-64 only has 8 sprite registers, so my partner invented a very clever rastering technique using the TV line scan register to dynamically allocate sprite registers to make it appear as if there were more than eight simultaneously appearing. The limitation was still that you could not have more than 8 sprites on any given row at any given time. The two heroes (the two guys the cooperative players would be controlling) are each made of two sprites (one for legs and one for upper body) controlled together. This meant that if the heroes were side-by-side, which they often were, and there were bullets flying from every direction, if we were not careful with the numbers, as a bullet was fired by an enemy vertically on the screen through the row the heroes were on and the limit had already been reached, suddenly you’d see legs disappearing and then reappearing as the body would then disappear and reappear! This looked kind of cool but we couldn’t release the game that way so we designed the placement and number of enemies so that it minimized the risk of that happening. Another programming issue was that one weapon that looked like a ball with spikes on the end of a chain. It would shoot out to the length of the chain, spin in a circle, then spiral inward toward the wielder in one more revolution. Each link of the chain was a sprite, separately controlled, in the original. This was not plausible on the C-64, so I, being responsible for all weapons programming, designed a similar thing without the chain. It was cool enough. Of course the C-64 didn’t have the processing power to do the trigonometric equations necessary for the motion control so I did I did it all with lookup tables and linear interpolation. Another aspect to the original game was the smoothly scrolling background. We drew the graphics for the backgrounds out of a set of “primitives,” character-sized blocks utilizing the bit patterns for the type fonts. Instead of the bit matrix for the letter “A” for example, we’d have that be a piece of a tree. For each level, we were able to build all the background pictures using 255 small graphic blocks. This was very thrifty on storage. So for every level (of the 7 levels), we would store a character font set, and however many screens worth of background at 8 bits per character with however many characters could fit on the screen (I forgot how many that is but it’s not a lot). Then I had to design an algorithm for smoothly scrolling up and down and loading the correct screen from RAM (each new level would require a load from the disk). At one point during the game, on one of the higher levels (I forgot by now), there was an enemy weapon I called the “grab-squish” where some claw-like device came down from the top of the screen and would do damage to the hero if it touched him. I thought that it would be cool in the C-64 version if it actually cut the hero in half. After all, the heroes were made of two sprites each. It would have been easy to program that. I wasn’t even talking about blood but the supervisor told me that it would be too gruesome and we wouldn’t be doing that. Look at some of the games today! I guess at the time, society wasn’t ready for that. Also, speaking as a father of video game playing children, I wouldn’t approve of that kind of game in my house now. See how our perspective changes with time and experiences? Finally, the 31-hour day. We were coming up on the 4th deliverable (I think it was the 4th). We had a lot of work to do before we shipped. There were bugs in the software that had to be fixed and functionality that had to be added and it was the morning of the day before the deliverable. The deadline was 7pm the next day when the FedEx guy came for the overnight package to California. My partner and I worked around the clock, having lunch, dinner, breakfast, and lunch at restaurants near FACS (West Bloomfield, Michigan). It got to be 6:30pm on ship day when the final software was ready. The supervisor was there and he and I raced around to make copies, write out shipping labels, find overnight envelopes. We ran down the stairs from the 3rd floor of the Crowne Center Building to encounter the FedEx guy just walking in. After we handed him the package, the supervisor and I high-fived it and then collapsed on the stairs. That 31-hour day also happened to be my birthday. What a day! That supervisor went on to have a successful career at Ford Motor Company as did I. I am still at Ford. Search Google for “teslak patent” to see some of the things I’ve done there. I have inspired others to design video games. Victor Merceica is a well known game designer and producer in California. He has been written up in magazines and has worked for many popular game companies from Atari, Sega, etc. to movies where, for instance, his name in the credits in Dreamworks’ Madagascar 2″. I’ve known him since before I could drive. He told me that I was his inspiration for his career path. “FACS was involved in other games beside this one. The game by Epyx called, “The Games: Winter Edition” (ca. 1988) was converted from C-64 to PC by me and about 6 others. I did game programming and all the music and sound effects. My name is in the credits in 3 places. 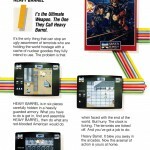 It was nationally released by Epyx. There are YouTubes available showing the playthrough (I think, with a German narrator) which includes the credits. FACS also worked on a game for Apple II called Spiderbot. I still keep in touch with the programmer of that game. He told me that there was a playthrough video available as well. There were others including the beginnings of an original game by FACS that was to be some sort of “helicopter point-of-view flying through city streets kind of game. I never was involved in that one so my details are sketchy. I see a Commodore 64 Heavy Barrel instruction manual on Ebay right now for Heavy Barrel that comes with 2 IBM disks. I saved the photo on my phone. Thanks everyone! Added a scan to the page. I think and I am pretty positive that I owned this game for Commodore 64. I bought it brand new. I opened the factory seal and played it once. I then sold it on Ebay a week later back in the year 2005. I think I bought it from someone in Canada. I think my Paypal holds the proof that I bought it and I am not sure. I had so many transactions to go through PayPal that it’s to difficult to find the proof. That’s interesting to hear David, if you do ever uncover anything – let us know. As far as we are aware, the game got cancelled as the company went under before it could be finished. Maybe another version was developed, who knows? 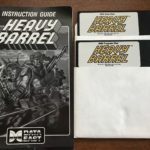 I was an employee of FACS in 1989 and was one of the two software programmers working on the Commodore 64 version of Heavy Barrel. I left the company about one month before it went out of business.